Outdoor Metal Sound Sculpture are musical instruments called Harmony Wind Harps TM and they awaken the connection to nature through the Power of Sound. Imagine the value of creating your living environment to support the awakening of a heart-centered spiritual awareness. 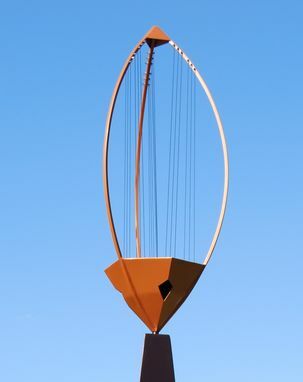 Welcome to the Aeolian Wind Harp, an ancient stringed instrument that plays nature's most soulful music. 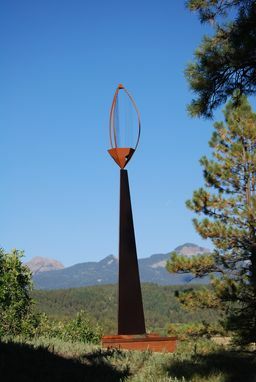 These contemporary Aeolian metal Wind Harps interact with gentle breezes to play completely unique music, which is totally in harmony with the elements of nature. Our contemporary Aeolian Wind Harps sing beautiful harmonic tones when an 8-12 MPH steady breeze flows through the strings . 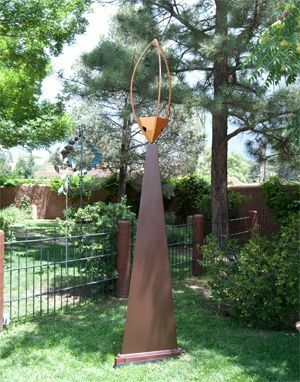 Designed and hand-fabricated by Ross S. Barrable, an acoustic sculptor / musician with 33 years of experience, developing and refining his art-form. 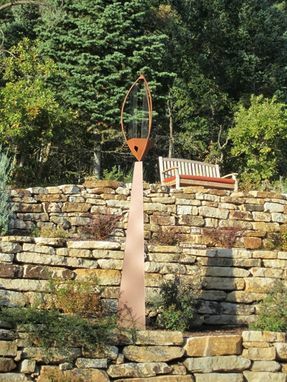 The Harmony Wind Harp transforms your outdoor space into an intimate and magical oasis of connection that inspires you to more deeply appreciate the visual and auditory beauty of the moment. Powder-coated finish, custom colors available, 18 tunable strings , with stainless tuners, comes with complete maintenance manual , extra strings and tuning wrench. Dimensions: Overall Height 10.5 feet --11.0 feet width -- 24" Depth -- 24"